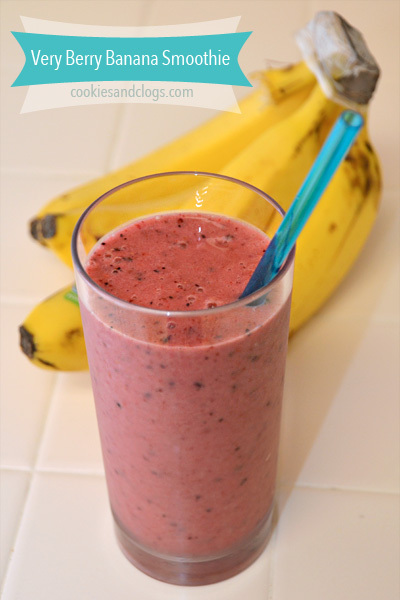 The inspiration for this Very Berry Banana Smoothie recipe came during last summer. I tried several different drinks at Jamba Juice and finally found one I liked called Razzmatazz. After reading the ingredients on the menu board, I figured it would be easy enough to make at home and save the extra $4 or so. This smoothie recipe only requires four ingredients. I actually like my Very Berry Banana Smoothie recipe better than the original. It’s much cheaper than buying it at the Jamba Juice and it’s super easy! It has just the right amount of sweetness and tanginess. My daughter and I drink this regularly for and/or with breakfast. Plus, there’s no dairy, gluten, or sweeteners in it – whoo-hoo! Break banana into 3-4 pieces and put in blender. Add the frozen strawberries and mixed berries afterwards, otherwise they might re-freeze together. Blend ingredients together until no chunks remain. Makes enough for one 8 oz. glass. I’m not much of a daring cook but I love coming up with new smoothie recipes. When working with fruit, you can pretty much through in anything and it will end up tasting great. I’ve even experimented with making green smoothies but I still need to develop my palette to get those down. What smoothie recipes have you come up with lately? All 3 of my kids love making their own smoothie creations; this would be a hit here. Thank you for sharing. Thanks – and thank you for the rating as well! Yummy! It is so much more inexpensive to make your own smoothies at home. Plus you know what goes in them and they are healthy! I am stealing this recipe! So true! The costs of buying these at the shop really adds up. Feel free to steal it 🙂 Enjoy! I have a bunch of frozen bananas in my freezer so I’m going to grab some berried so I can make this. Yum! I hope it turned out good! I like the ingredients you selected to go together, it just sounds good ! This sounds awesome. My kids love smoothies and my grandmother gave me a smooth maker to make the kids smoothies and I still haven’t used it. LOL. Smoothie maker? Like a Magic Bullet? If so, it’s SUPER easy! Mmmm! My daughter and I love smoothies like this! Looks delicious! I’m trying this tomorrow! I can’t have dairy and that makes finding a quick and easy smoothie not so easy. I can’t wait for morning 🙂 Thanks for posting!! I love this smoothie so much. I made one addition that I really enjoy. I add half a cup of organic French vanilla yogurt. Delicious!! I’ve been drinking smoothies a lot lately, so I’m definitely adding this to the list! These are some great recipes, can’t wait to try it. Jamba Juice becomes too expensive after awhile. Nice simple smoothie recipe. I do similar and add cup spinach because you can’t taste the spinach and its healthy. I like to add raw oats to thicken it up and make it more filing. Thanks for the nice berry-banana smoothie recipe. Those are my most favorite smoothie ingredients and I also love my greens in my smoothies.